It’s that time of year again. The time when some of us resolve to buy a gym membership and only use it a few times. It’s the time when we pledge not to spend on what we can’t afford only to come home a week later with a new wardrobe. It’s resolution time. The same goes for the Anaheim Ducks. They continue to hover above the playoff line but could be more comfortable if they make, and stick to, these three resolutions. The Ducks continue to lack discipline with damaging results. Last season, they ranked fourth in the league in times shorthanded and surrendered six power play goals in a first-round sweep to the San Jose Sharks. It’s been much of the same this season. The team ranks second behind the Colorado Avalanche in time spent shorthanded, but there’s been one major difference. The Ducks are scoring goals at a lower rate than they did in 2017-18. Averaging 2.45 goals-per-game this season, their offensive woes have also continued. When you combine this with their discipline problems, you can see just how razor-thin their margin for error is. The Ducks’ penalty kill surrenders an average of 0.73 goals-per-game. That’s only 10th-worst in the league, but the difference between the average goals-per-game they score and the average power play goals they allow per game is tiny. They score only 1.73 more goals-per-game than they give up when they’re shorthanded, which is second-worst in the league and is by far the worst mark of any team currently in a playoff position. The only team with a weaker mark in the league is the last-place Los Angeles Kings. With the team’s reliance on strong goaltending, it is vital to cut down on the penalty junk food. It decreases the workload on John Gibson and increases the amount of time they can play offensive specialists like Ondrej Kase and Pontus Aberg. The old excuse “It’s a Randy Carlyle coached team, they’re going to take penalties” isn’t an excuse. Yes, he has helped keep the team in the playoff hunt with a devastating amount of injuries, but the goal of an NHL season isn’t to scrape into the playoffs and get swept in the first round. If Carlyle’s style of coaching means a continued march to the penalty box, it may be time to make a change in 2019. “Get bodies in front of the net.” It’s a time-honored cliché that goes along with “get pucks deep, get pucks to the net,” but there’s a reason teams harp on it so much. It works. In the Ducks’ case, it plays to their strengths and avoids their weaknesses. Anaheim’s inability to adapt to a faster playing style means they struggle to take advantage of quick transitions and odd-man rushes. Their combination of big-bodied physical forwards like Nick Ritchie, Ryan Getzlaf and Ryan Kesler and skilled finishers like Aberg, Kase and Jakob Silfverberg thrive off the chaos and confusion in front of an opponent’s goalie. Anaheim’s first goal from their last game against the Sharks is a perfect example. Ritchie, who has scored three of his four goals off deflections or rebounds from point shots, is again standing almost on top of Sharks goalie Martin Jones. Ritchie tips the shot, and before the San Jose defense has any time to react, Silfverberg collects the rebound and showcases his nifty hands to tuck it in past Jones. This is their recipe for offensive success. Yet, there are power plays and long stretches in games where they allow opposing goalies a clear view at shots from the point and fail to create chaos in front of an opponent’s goal. For 2019, they need to buy a pass to the “net-front gym” to get those offensive gains in 2019. Like many of us, NHL teams need to avoid buying new toys they can’t afford and make smart investments instead. This applies perfectly to the Ducks. 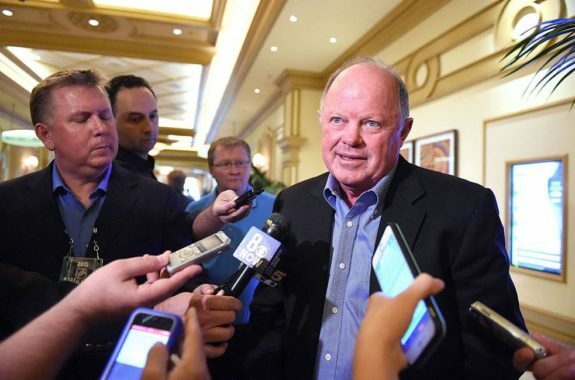 While Anaheim has spent more time this season in a playoff position than not, it’s still clear they have major issues that prevent them from being considered a true Stanley Cup contender. From their offensive inconsistency to their tendency to allow opponents too many shots to their aging and expensive veterans, the Ducks should be patient. This is why GM Bob Murray should avoid giving up young assets to try to land a big name at the trade deadline. Players like Matt Duchene and Mark Stone of the Ottawa Senators or Wayne Simmonds of the Philadelphia Flyers would provide a much-needed injection of offense to the Ducks’ lineup and all are unrestricted free agents after the season. Yes, the pending return of Corey Perry and the disappearance of his long-term injured reserve cap relief creates some uncertainty when it comes to the team’s contracts and their budget, but there is an even bigger issue. A big-name player like that would cost the Ducks at least one of their young up-and-comers. Back when Toronto Maple Leaf William Nylander’s name came up in trade rumors, some posited it would cost Anaheim an established defenseman and a player like Josh Mahura, Max Jones or Troy Terry. Sure, for teams in a “win-now” situation, that may be a worthy price to pay for a chance at the Cup. However, that isn’t the Ducks right now and there’s no guarantee that any rental player acquired for a prospect will re-sign. Luckily for Ducks fans, that hasn’t been Murray’s style. He’s continued to make small adjustments like claiming Aberg off waivers at the beginning of the season or trading for reclamation project Daniel Sprong. A hesitant trigger finger, which may have been a weakness when Anaheim’s window of opportunity was wide-open, may be a strength now that they appear to have a developing young core. That’s why the Ducks need to bank their young prospects like Max Comtois, who’s lighting it up as Team Canada’s captain at the World Juniors, Kiefer Sherwood, Sam Steel, Mahura and Terry and watch that investment grow. Don’t go out and buy that shiny new scoring forward if it means you can’t afford your rent later. Just like all of us, sticking to these 2019 resolutions will bring the Ducks a successful 2019.